Lustrous peacock freshwater keishi pearl, black onyx, and sterling silver earrings. Each smooth black onyx bead is topped with a sterling silver wave bead with a brushed finish and three gorgeous peacock freshwater keishi pearls glowing with silver, purple, plum, gray, and copper colors. The pearls and onyx gems are wire wrapped on sterling silver beaded headpins, and the genuine keishi pearls have superb luster. The pearls and onyx gems dangle 21mm (13/16") from heavyweight sterling silver ear wires, and the earrings measure 35mm (1 3/8") from the tops of the ear wires. These earrings will be shipped with a pair of safety backs so that you or the gift recipient will never lose an earring. 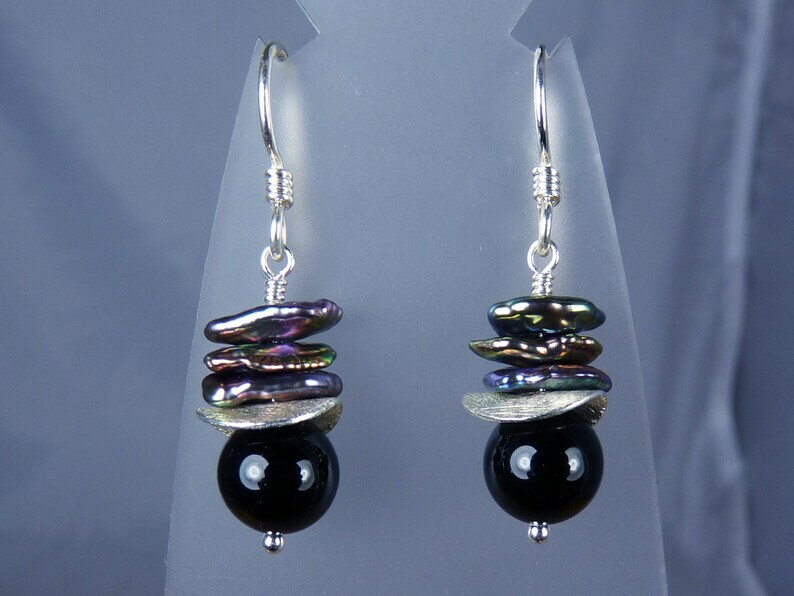 These sophisticated peacock keishi pearl and black onyx earrings are stunning!